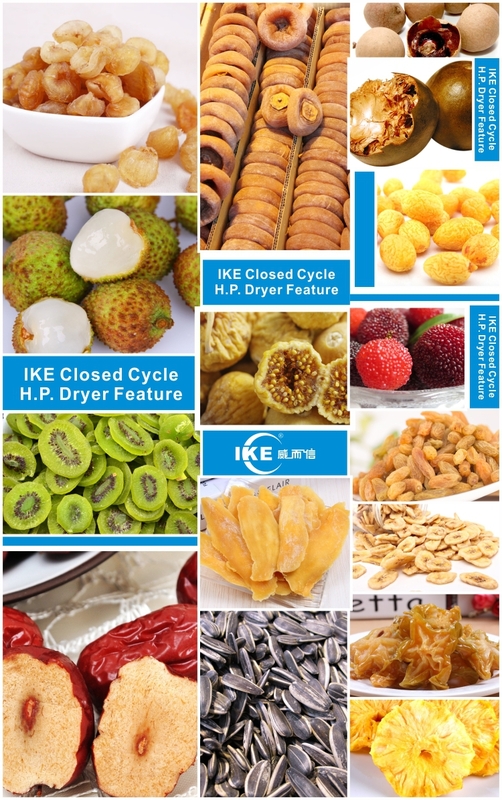 Buy Professional IKE food processing dehydrator machine for onion flakes - Jinan Joysun Machinery Co., Ltd. Hot air only circulates inside and no energy is lost.Drying efficiency is independent of external weather conditions.Only water is released from a drying house.The energy saving is incomparable to traditional drying machines. 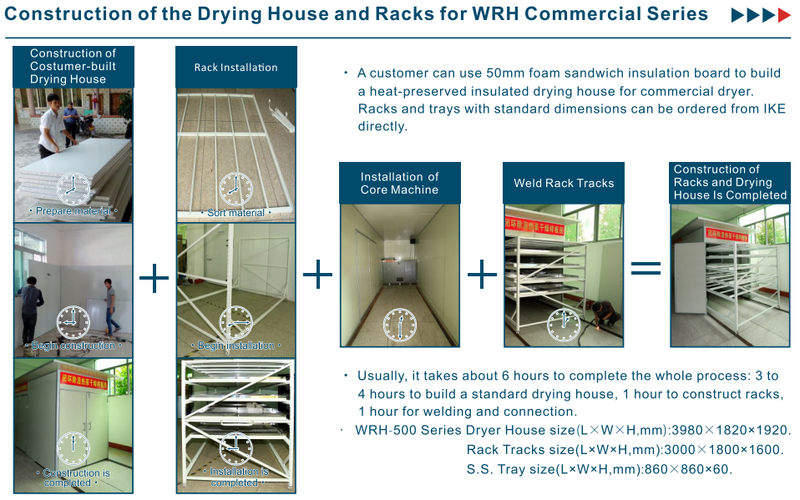 With inside core machine,the performance of the dryer is independent of external weather conditions and it can be installed in any location. No active ingredient exchange with low temperature drying ,hence different material can be dried together to increase productivity. No air exchange with ourside keeps active ingredients in the material,prevents contamination,and maintain effcient drying. With dehumidification drying at low remperatures,the material can be dehydrated quickly and will seldom deteriorate. Closed-loop design makes strong wind convection and even drying.No human labor is needed to flip the material. Since the core ,machine is pushed in directly with no pipe connection,it can be installed within ten minutes. 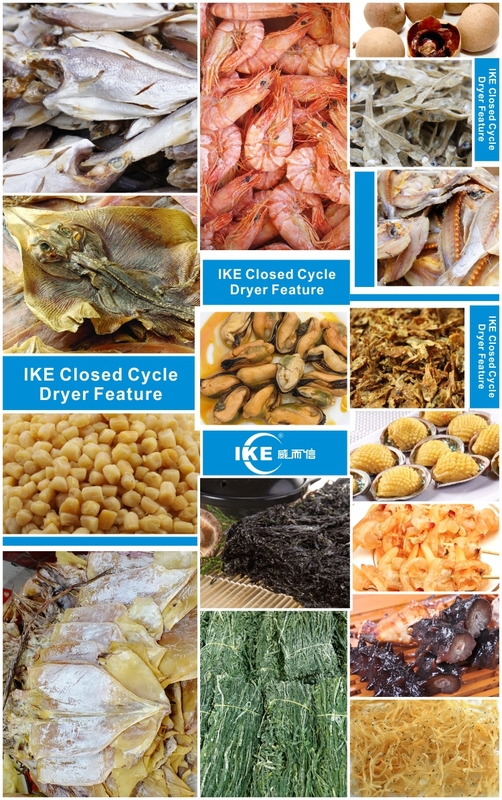 What Benefit The IKE Dryer Bring To You? With closed cycle dryer withour turning frequently,saving a lot of labor costs. Using closed cycle dryer,the energy saving more than 20% than traditional open cycle dryer. Free from external influences,every day can produce,production period from few month to whole years,thus greatly improving the productivity and profitability. Solved the problem of the external envirnorment pollution,product quality can be achieved food grade,so the product prices degree is better than other drying method,you can also enter the high-end market,reduce vicious competition, resulting extra profits. IKE Group invested 350 million for Guangdong IKE industrial Co. Ltd. in Meizhou high-tech zone, Guangdong Province. IKE industrial is a modern high-tech enterprise focus on design and produce heat pump water heater, heat pump dryer, floor heating and Air conditioner .The application of IKE heat pumps range from sanitary hot water supply, house and space heating, swimming pool heating to commercial usage. Factory area is 110,000 square meters and it is the one of the biggest heat pump enterprise in China. The company has sheet metal, injection molding, painting, Eva. & Cond, carton &foam, water tanks, assembly, and other advanced production line. The configuration of laser cutting, CNC punching, CNC bending, automatic welding and other advanced production equipment and imported testing equipment. We have national standard laboratory, designed annual production 600,000 sets of various types of heat pump products, the annual output value of 350 million dollars. The company has a large number of technical, management and marketing personnel, combined with the group for 20 years of technology and experience, research and development series product to subvert the traditional air source products. Only to be imitated, not be exceeded! We are self-esteem, self-confidence, self-reliance, will certainly become the industry leader in air source!